Are you guys getting into the season, yet? I know it’s still November… but I can’t help but let the holiday cheer start to creep in. I’m working on an advent calendar for Maya, and am thinking about getting our faux tree out pretty soon. Bring it on, Christmas! One thing I HAVE already done is to make up a new batch of handmade christmas ornaments. 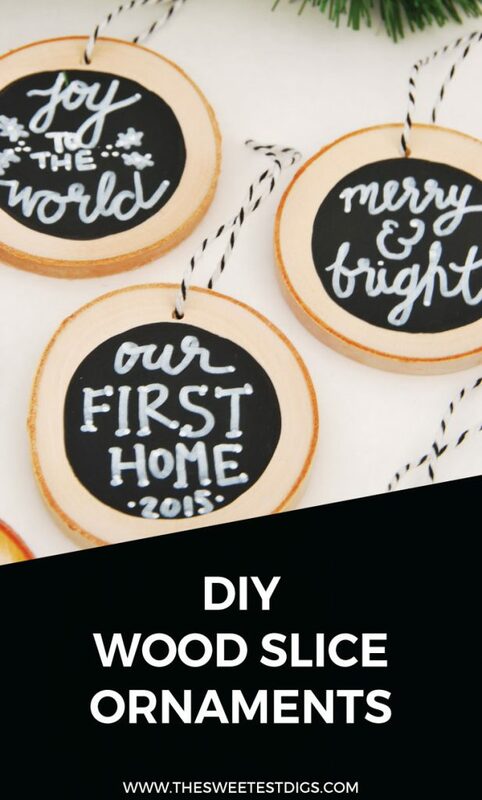 These DIY beauties have a rustic vibe, made from wood slices and chalkboard paint. Chalkboard paint – I use that Rustoleum brand linked… my small quart has lasted me AGES! Baker’s twine – I personally like black and white, but there are lots of colour options! Step 1 // If your wood slices don’t have little holes pre-drilled into them, then use a drill to make small holes along the top of your wood slice. This will be what you’ll thread your string through to hang them. 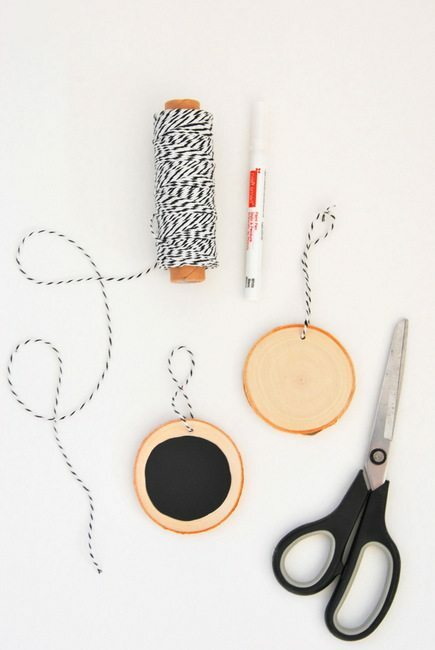 Step 2 // Using a paintbrush and your chalkboard paint, paint a black circle on your wood slice. This will be the background for your customization. I find it easiest just to free-hand the circle, but if you’re nervous, draw it out with pencil before painting. Step 3 // Once the chalkboard paint has dried, decide on the message or design you want. Use a pencil to create your design first if you are nervous about free-handing, and then simply use your paint pen to apply your design! Paint pens make it sooooo much faster and easier than having to use white paint and a paintbrush, and it gives that chalkboard look but in a permanent way. They are a total win – a must have in your craft cupboard! Step 4 // Run some baker’s twine through your hole, tie a knot, cut off the excess, and bam. Some seriously cute ornaments, right? I did a few different designs. Generic ones like “Joy to the world” and “merry & bright”, but also some personalized ornaments that would make really sweet gifts. Know someone who bought their first home this past year? 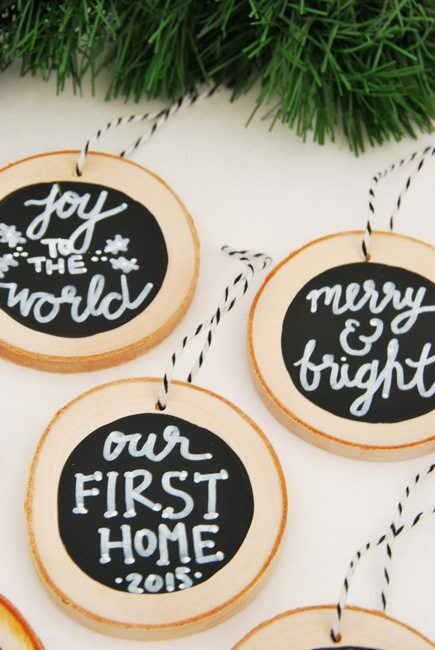 Do the “My First Home 2015” ornament. Was there a baby born in 2015? 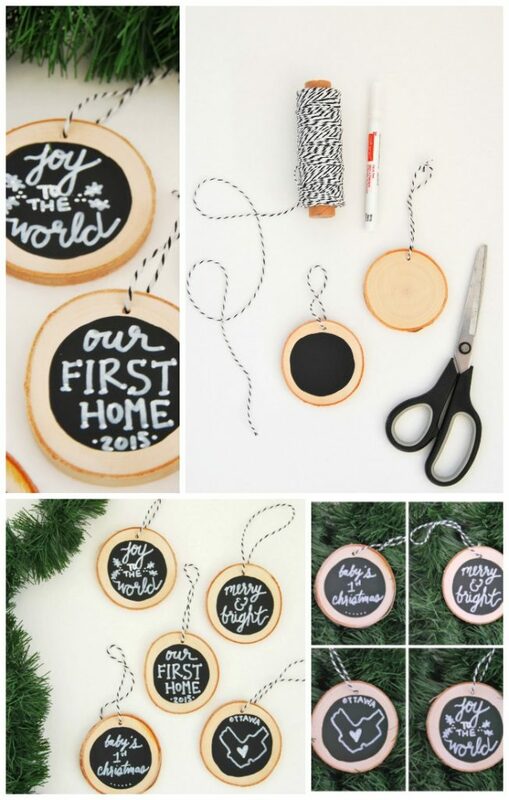 Make an ornament for his or her first Christmas! I also had fun doing the little map print of Ottawa (my hometown). Just google the outline of a particular city/province/state/country and copy it, add a heart, and write the place name. The chalkboard look is rustic and sweet, but since the “chalk” is permanent you don’t have to worry about the designs rubbing off. I have found that I didn’t need to seal it with anything and they don’t chip or scuff. Cute, right? These make really sweet little gifts or stocking stuffers. I have also attached them before to the top of a gift – kind of like a gift tag – which totally takes your gift up a notch. If you’re looking for more ideas, check out these painted wood slice ornaments I made a few years ago. They were way more colourful and had fun geometric patterns. They have a whole different vibe, and I still love them! 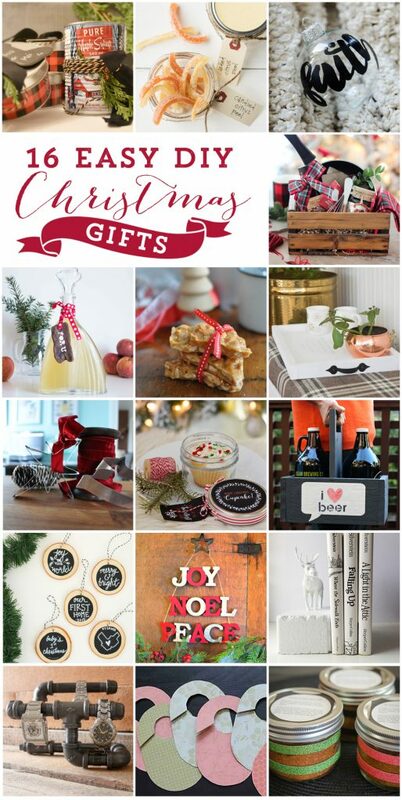 Want more handmade christmas gift ideas? 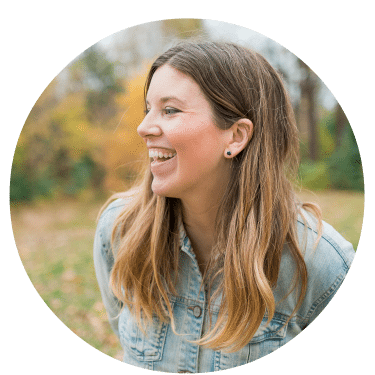 Check out what my blogger girlfriends have been up to. 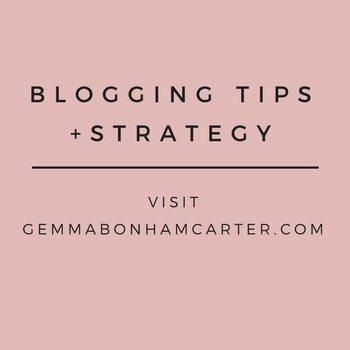 Some really good ideas in here! Have fun! Let me know what handmade gifts you’re up to. Or any other Christmas ornament ideas. I want to make some with Maya this year! Sooo cute! What a great idea for a personalized gift! Perfect for a stocking, or to send in the mail. Love it! Exactly! They are super light and easy to mail. Thanks Lindi! I make ornaments for my extended family most years. Pinning to remember this for next year (as I’ve already got this year’s on their way). These are so sweet, love how you personalized them too. This is right up our alley! What a great way to personalize a Christmas ornament. And I really love the baker’s twine you chose. I will need to get myself some of that! Oh my goodness, I use that baker’s twine for EVERYTHING!! Definitely grab some next time you’re at a craft store – it’s so cute.